This ring covers part of the Stratford-on-Avon Canal, some of the mainline Grand Union Canal and a little bit of the BCN (Birmingham Canal Navigations) and can be completed in a 4 night break (or 3 nights if you are very energetic). Travel South along the Stratford-on-Avon Canal, passing through slightly more urban areas at first - facing the many back gardens of houses that line the canal - under a very interesting 'guillotine lock', followed by the 352 yard Brandwood Tunnel and then down the narrow Lapworth flight of 18 locks through pretty countryside to Lapworth Junction. Turn left here, up the Northern part of the mainline Grand Union Canal towards Birmingham itself, passing through a mixture of rural and urban landscapes, then just after Solihull you will enter Birmingham (and the BCN) heading towards the colourful Gas Street Basin and Brindley Place, where you can moor up and enjoy the canalside shops, restaurants and pubs. Heading West from here you encounter a flight of 14 locks at 'Farmers Bridge' before completing your circuit. En-route, why not pay a visit to nearby Cadbury World? How wonderful to have a shorter ring that you can complete in 4 night break (or 3 nights if you ready to cruise for a few more hours per day). The Droitwich (Northern) part of the route was cleared of debris, had new locks and swing bridges fitted and was re-opened in 2011, providing us with a whole new ring! The route takes you from the Worcester & Birmingham Canal, South down to Worcester, followed by a jaunt up the much wider River Severn, with it's manned locks and then back onto the Worcester & Birmingham Canal via Droitwich. This ring is mostly rural, passing through farmland and small villages, with a few locks along the way, making it very suitable for families with children to entertain. A stop in the marvellous city of Worcester - home of Royal Worcester Porcelain - is well worthwhile. It has a 12th Century cathedral overlooking the River Severn and is the site of the final battle between the 'Roundheads' and the 'Cavaliers' in 1651. There are plenty of shops, pubs, restaurants and some lovely Tudor timbered houses to admire. This is also where our famous Worcestershire Sauce comes from! This ring is a really great option for a short break. This lovely route offers great contrasts between past and present and between open countryside with fantastic scenery - a walk up Cannock Chase is well worth the effort - and urban, historic areas through which you can cruise, gazing in wonder as you discover the network of canals and tunnels that pass through, and under, Birmingham and the surrounding area. Sandstone cliffs and caves dot the northern part of the route alongside some great waterside pubs and small villages. Along the way, why not stop at the market towns of Penkridge or Rugeley and visit pretty Fradley Junction? Wonderful old roundhouses appear on this route and the one at Gailey is still inhabited to this day. Passing across lake-like Tixall Wide near Great Haywood is quite odd, with it's elaborate stone gatehouse nearby. The flight of 21 locks at Wolverhampton will definitely keep you busy as you cruise down towards central Birmingham. This ring allows boaters to explore the BCN, otherwise known as the Birmingham Canal Navigations and is one for real canal enthusiasts. The BCN are an amazing network of canals, junctions, locks and tunnels that take you on a real mystery tour - under buildings, city streets and squares, past industrial estates and alongside railway lines, discovering hidden 'bits' everywhere and truly fascinating evidence of the industrial revolution when these waterways were used as main routes in and out of Birmingham - this is not the prettiest part of the route, but it is extremely interesting nevertheless. In contrast, other parts of this ring offer some of the loveliest scenery on the Midlands canals, through pleasant countryside with olde-worlde pubs punctuating your journey. You may also wish to visit the open-air Black Country Museum at Dudley or stop off at Drayton Manor Theme Park and Zoo, along the way. This cruising ring is very popular with boaters as it offers such a diversity of experiences. 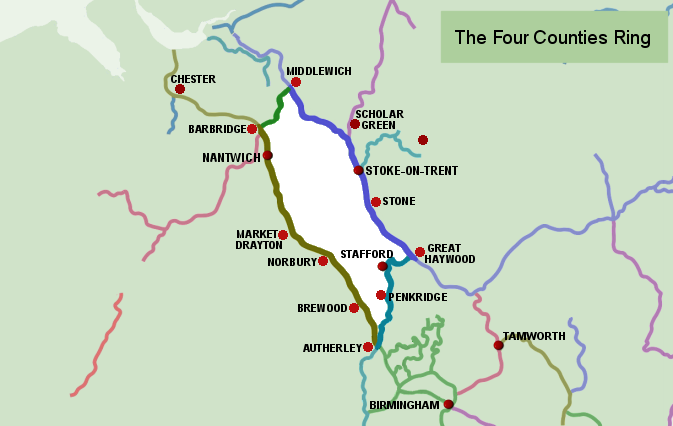 The route passes through Staffordshire, Cheshire, Shropshire and the West Midlands - thus the 'Four Counties Ring'. Cruise through pretty countryside and stop at picturesque market towns or historic centres of industry, visit museums (e.g. The Potteries Museum in Stoke-on-Trent or The Cheese Museum at Nantwich) ornate estates with gardens (Shugborough Hall) or Castles (Stafford Castle for example). The 'Four Counties' offers so much variety! It can take you from one end of the spectrum to the other - through lock-free stretches, followed by 'Heartbreak Hill' (a flight of 26 locks) and then through the fabulous 2926 yard long Harecastle Tunnel. The Shropshire Union Canal in particular, has lots of character with it's deep 'cuts' and high arched bridges. Over a 7 night holiday, this route will require you to cruise for at least 8 hours per day. If you are inexperienced boaters, you may prefer to cruise this route over a longer period if possible. Or add another week on to take a detour down the pretty Caldon Canal, just East of Stoke on Trent. Very popular once again as this route is split between fabulous countryside with lots of waterside pubs dotted alongside the tree -lined canal and some incredibly interesting historic industrial areas, passing right through the middle of Birmingham. The Ring includes an intrepid voyage up the wide River Severn (UK's longest river) between Worcester and Stourport - with it's historic marina and 18 th Century warehouses. A surprising passage then follows under urban roundabouts one minute, then surrounded by fields of sheep, cruising through flower-strewn, green corridors the next. The scenery between Kidderminster and Stourbridge must be some of the prettiest on the canal system. Teamwork is the key to working the 26 lock Tardebigge Flight and there are tunnels and caves hewn from limestone to discover along the way. Don't miss the opportunity to visit the Black Country Living Museum (a nostalgic step back into the past) or through the Dudley Tunnel and on your return journey a visit to Cadbury World can be lots of fun too! A reasonably energetic week's cruise taking approx. 8 hours per day. This Ring offers a real combination of rural and urban sights and scenery, offering some great places of interest to visit for adults and children alike, such as Warwick Castle, Drayton Manor Theme Park with it's family rides and zoo, Coventry Cathedral or Tamworth Snowdome. Stop in central Birmingham at Gas Street Basin with it's many pubs and restaurants, mooring alongside the brightly painted boating community there; travel through the dark and sometimes wet tunnels and up the 21-lock Hatton Flight. Chocoholics can even make a detour to Cadbury World! There are two choices of route, either passing through Solihull or south from Kings Norton Junction down the pretty Lapworth Flight of narrow locks, so cruising hours can vary between 7 and 9 hours per day over a 7 night break. Taking a few extra days would allow you to spend more time at some of the many attractions along the way. This fabulous route is made up of two halves, one half canal with it's traditional locks, tunnels and aqueducts and the other half much wider areas of river (River Severn and River Avon) - so it gives you the chance to have a real boating adventure whilst being surrounded by some of the prettiest countryside and most interesting towns and cities in the area, including Worcester with it's 12th Century cathedral and famous fine porcelain (also the home of Worcestershire Sauce) and historic Stratford-upon-Avon with it's Tudor half-timbered houses - famous birthplace of William Shakespeare and home of the Royal Shakespeare Company (maybe book an evening at the Theatre). The River Avon is privately owned, so an additional licence is required to cruise along here, but it's well worth doing so, as the river's edge boasts many pretty towns, churches, old stone bridges and some lovely pubs. The canal part of this route is quite energetic with flights of locks here and there, including the 36-lock Tardebigge Flight and the pretty, narrow-locked Lapworth Flight. This cruising ring definitely gives you a bit of everything! It is strongly recommended that you book more that 7 nights in order to complete this ring - a 10 or 11 night holiday (or longer) would be perfect. This ring gives you a real range of canal scenery and experiences. It's route takes you through glorious countryside, past pretty villages and bustling towns such as Macclesfield with it's medieval market place and church, passing by historic industrial architecture and offering fabulous views over the beautiful Cheshire Plains and the Peak District National Park, cruising across the 100ft high Marple Aqueduct, followed by an interesting journey deep into the heart of Manchester (past Old Trafford Stadium) along the Ashton and Rochdale Canals. This route bypasses the Anderton Lift - an amazing feat of engineering that literally lifts boats from the canal, turning to deposit them on to the River Weaver behind - perhaps you'd like a go? There are plenty of locks (such as Heartbreak Hill's; flight of 26) aqueducts and tunnels along this route, so it's probably best suited to those of you who are energetic, more experienced boaters. Otherwise, you may wish to allow yourselves more than a week to complete the ring. The Cheshire Ring will take you at least 9 hours per day over a 7 night break. The Leicester Ring has a wonderful mixture of narrow canals, wide canals and river navigations with lots of locks, tunnels, aqueducts and places to explore. It's an excellent choice for those of you looking for a 10/11 night to 2 week cruise on our fantastic canal system. This route includes the Grand Union, North Oxford, Coventry and Trent & Mersey Canals, plus the pretty River Soar that winds it's way North from Leicester - Leicester itself is one of the oldest cities in England, dating back more than 2000 years and even has it's own Roman Baths. On the Leicester arm of the Grand Union Canal you can climb through the 10 staircase locks at Foxton, with the nearby remains of an inclined plane - a trip to the museum there will explain all - to the amazingly secluded summit level which meanders along 22 miles of Leicestershire countryside at a height of 412 feet above sea level, through dank tunnels and past the Market Harborough Arm (a little detour is well worthwhile) then down 7 more staircase locks at the village of Watford. Cruise through the 1.16 mile long Braunston Tunnel and up past Braunston itself - the historic centre of our canal system - under ornate cast iron bridges, following the quiet and rural North Oxford Canal towards Coventry - the restored basin there is now home to galleries, shops and cafés. At the junction with Coventry Canal, Hawkesbury stop lock lifts your boat just 4 inches from one canal to the other! If you choose to take a 2 week break, you may also wish to explore the nearby lock-free Ashby Canal. Not for the faint hearted, this huge ring takes in the Grand Union Canal, River Thames and South Oxford Canal over a minimum 14 night break - longer if you want to do a bit of sight-seeing. This route is best done clockwise so that on the Thames part of the route you are travelling away from Brentford lock and up to the manned Thames lock at Teddington before continuing on your way (you need to work with tide times on this section and may need to purchase additional licences). The scenery is extraordinary, passing Hampton Court, Eton, Windsor, Henley, Oxford, Banbury and through the outskirts of London itself - there is an enormous amount to see and do. This route, being part river cruising and part canal, is fabulous if you're looking for variety, it encompasses the massive manned locks of the Thames with it's historic scenery including grand houses, castles, boathouses and waterside pubs; the South Oxford Canal with it's quiet, picturesque surroundings, lift bridges, narrow locks, and farmland and the mainline Grand Union Canal with it's long tunnels (the 'Braunston' and the 'Blisworth' are quite an experience), wider locks, stone bridges, low aqueducts, the quaint Canal Museum at Stoke Bruerne and many canal side pubs. 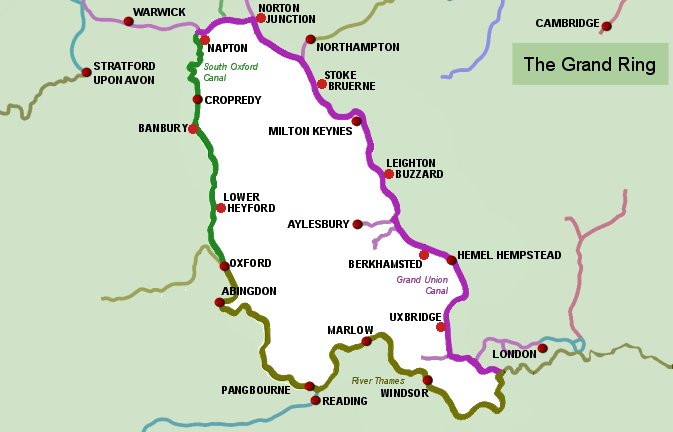 There are plenty of locks to keep you busy along the way - mainly along the Grand Union part of the ring between Leighton Buzzard and Uxbridge. This route is thoroughly recommended for adventure-seekers who want the full boating experience mixed in with some absolutely fantastic scenery. This large ring crosses the Pennines between Manchester, Leeds and Castleford. It is made up of the Bridgewater Canal, Leeds & Liverpool Canal, the newly restored Rochdale Canal, the Aire & Calder and the Calder & Hebble Navigations. There is plenty to do on this route including locks (the Bingley Five Rise are the steepest flight of staircase locks in the UK and the 20ft deep Tuel Lane lock is the deepest on the English Canal system) aqueducts and tunnels (the Foulridge Tunnel is a mile long with traffic lights at either end). This ring takes some of the hardest work on the canal system to complete, hence it is sometimes known as the 'Pennine Extremes'. Picturesque towns and villages, such as Todmorden and Hebden Bridge punctuate the lovely Rochdale Canal and the Leeds & Liverpool Canal in particular is quite extraordinary; It is very long and brought prosperity to many towns along its route, which still show the marks of the textile industry it served with it's fascinating stone mills dotted across the landscape here are there. In between the towns are miles and miles of lovely scenery, usually with panoramic views of the Pennines. The middle section of this canal, on the edge of the Yorkshire Dales National Park, certainly deserves its place as one of the most scenic canals in England. This ring is well worth the effort but give yourself plenty of time to enjoy it... be ready for some strenuous boating. This route provides real contrasts between urban centres such as Manchester, Rochdale and Huddersfield and the rugged Pennine crossings, which have some of the most striking views on the waterways. The breathtaking scenery of this ring is made even more remarkable as until recently some of it was completely derelict! Made up of the Calder & Hebble Navigation (locks here are operated by a handspike in place of the more usual windlass), Rochdale Canal, Ashton Canal and the Huddersfield Narrow / Broad Canals, this ring is a photographer's paradise with it's rolling hills and rocky moors; travelling through the heart of Britain's former textile industry and its dark satanic mills. Places of interest include traditional towns such as Hebden Bridge and Todmorden which are crammed with superb arts & crafts shops and stores selling local produce. The South Pennine Ring also takes you through the longest canal tunnel in the world - the Standedge Tunnel – which spans 3.25 miles - this is a fascinating part of the trip during which your boat is protected by rubber and towed through the tunnel by an electric tug in a convoy! This route has more than it's fair share of locks to do, including a flight of 31 just South of Huddersfield and is definitely suited to more energetic boaters. Please note: all daily hours are average approximate timings and you may need to do more than the given number of hours in any one day. You may need to allow time to cruise to and from the ring. Local weather conditions and boat traffic may also affect your journey time.